This 0-6-0T tank engine was built for 2 feet 6 inch narrow gauge in 1924 by Hudswell Clarke Co Ltd, of Leeds, England as works # 1486. You should have little trouble locating this locomotive in the town of Nigel. Just locate the local Shoprite or KFC outlet, and you're there! 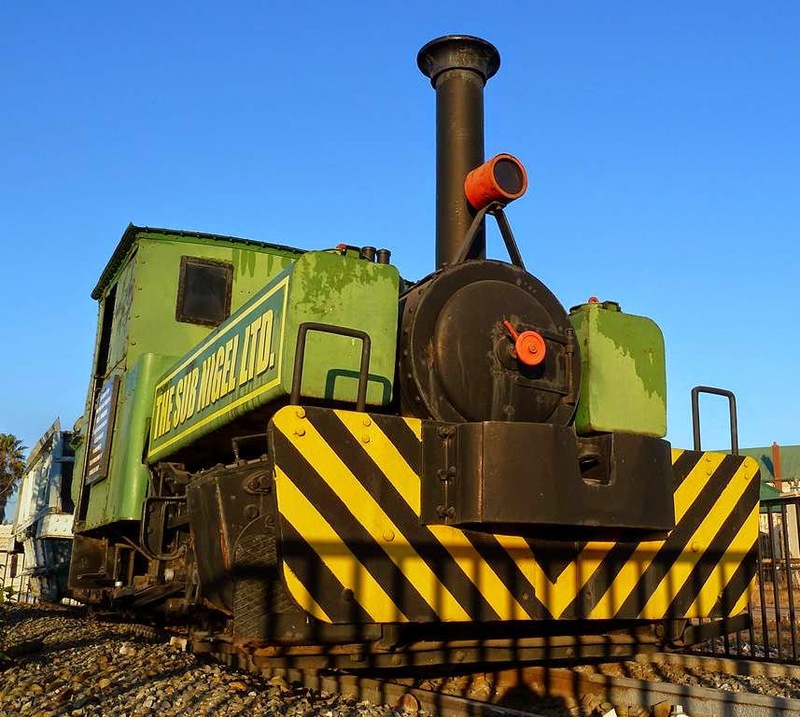 Like most well-known industrial steam locomotive manufacturers, Hudswell Clarke & Co. Ltd. of the Railway Foundry, Leeds, have designed and built locomotives for all conditions of service in most parts of the world, even when individual engines have been called for. The company was founded as Hudswell and Clarke in 1860. In 1870 the name was changed to Hudswell, Clarke and Rogers. There was another change in 1881 to Hudswell Clarke and Company. The firm became a limited company in 1899. The locomotive part of the business is now part of the Hunslet Engine Company. 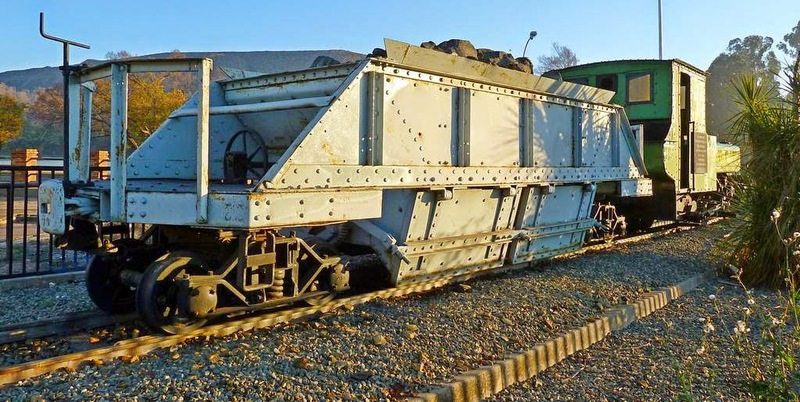 Locomotive-building was always only one part of a diverse product inventory that included underground diesel-powered mining locomotives, hydraulic pit-props and related mining equipment. 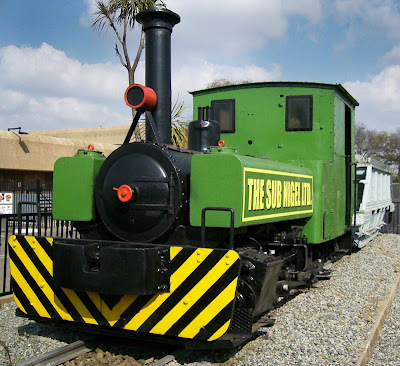 In 1911 Hudswell Clarke entered into an agreement with Robert Hudson for the manufacture of narrow gauge locomotives. This arrangement produced sixteen standardised designs, designated 'A' to 'Q', which ranged from four-coupled (0-4-0) 5 hp engines to six-coupled (0-6-0) 55 hp models. 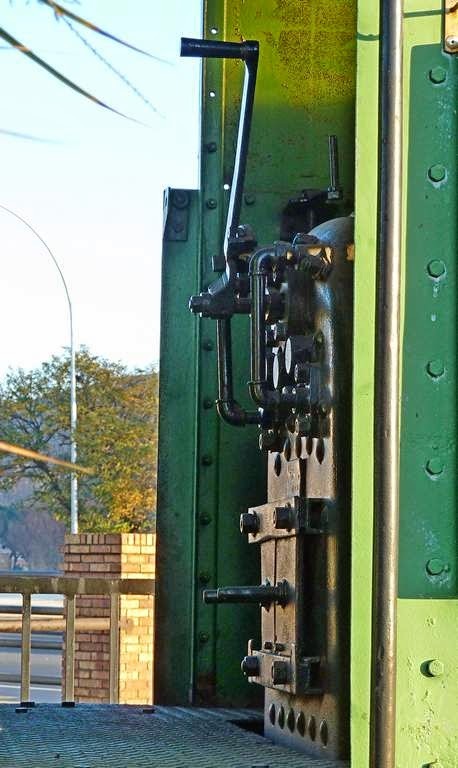 The designs were sufficiently flexible to allow for the various track gauges in use. Over the years, 188 locomotives were supplied to these designs. 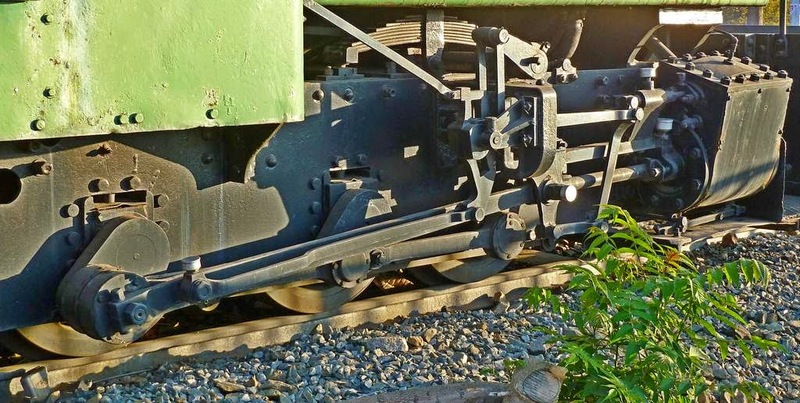 This locomotive has a 8,5" diameter cylinder x 12" stroke design. 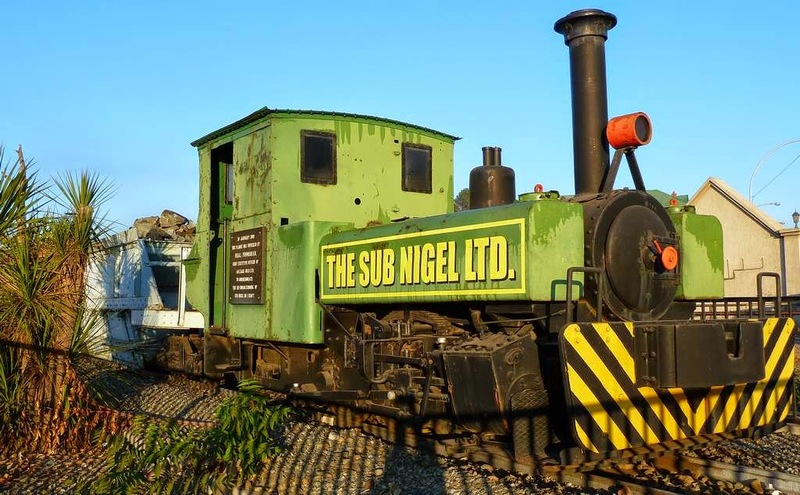 The engine worked as "SUB NIGEL No. 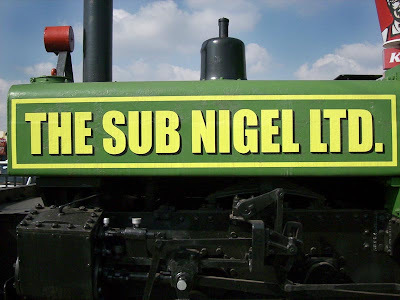 1" for Sub Nigel Ltd at Dunottar. The currently dormant Sub Nigel gold mine is situated 1 km northwest of the town of Nigel on the East Rand. The Sub Nigel mine produced 15 million ounces of gold from the Nigel Reef between 1909 and 1971. 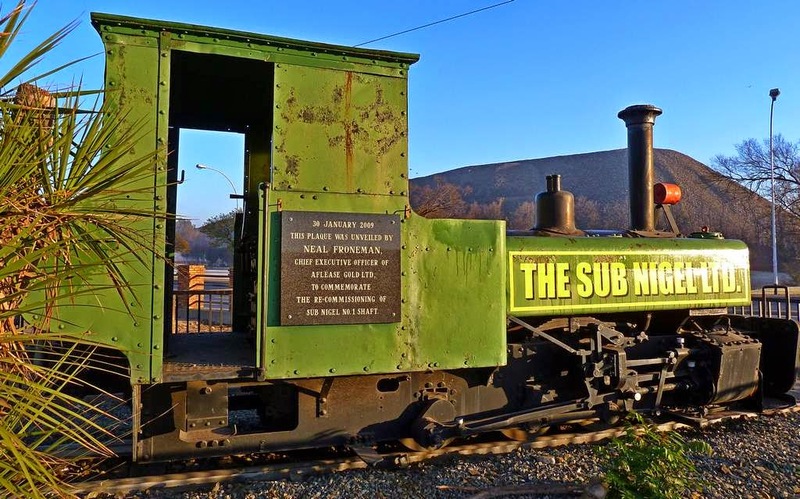 The locomotive was stored at the Nigel Municipal Nurseries, at Jim Fouche Park, for some years for a possible mining museum, but this did not realise. 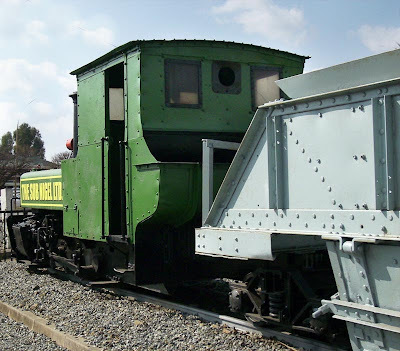 Eventually the locomotive was plinthed in Nigel town with one of her ore trucks in the current location. 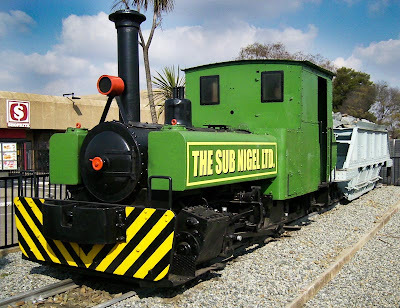 This locomotive SUB NIGEL No 1 has a sister engine SUB NIGEL No 2 plinthed at Gold Reef City. No 2 at work. Images above and below were sourced here & here. 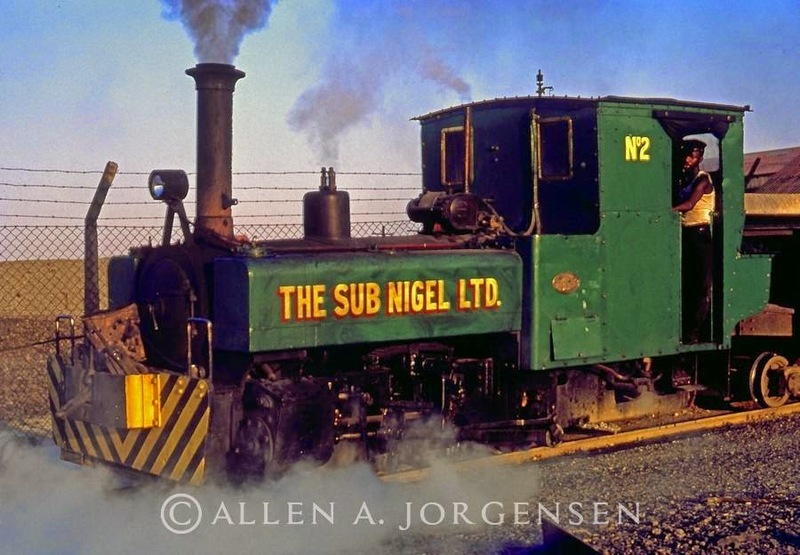 David Shepherd's painting of the Sub Nigel Ltd. locomotive. This artwork by well-known artist David Shepherd was published in the September 1987 edition of the South African PANORAMA. (this article appeared in the September 1967 edition of the Industrial Railway Record. In a darkened room on the outskirts of London a slide show was in progress. Suddenly one slide draws gasps of astonishment from the audience. 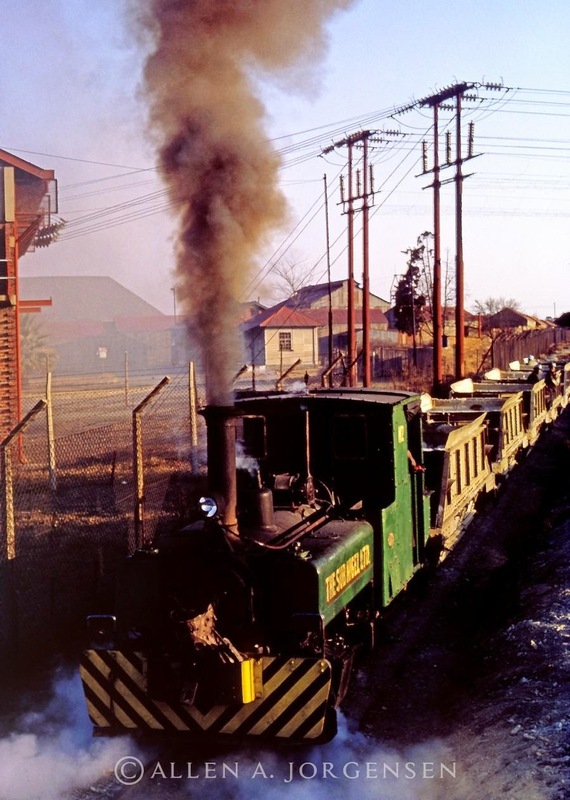 A reaction is transferred from a railway enthusiast in South Africa standing outside a small locomotive shed not far from Johannesburg to fellow enthusiasts 6,000 miles away. This is one of the pleasant things about railway enthusiasm. If you can't yourself visit the far-flung railway networks of the world you can at least enjoy the sight (and even the sound of them. We haven't yet got around to being able to record the smell, but in this case it wasn't particularly of moment! 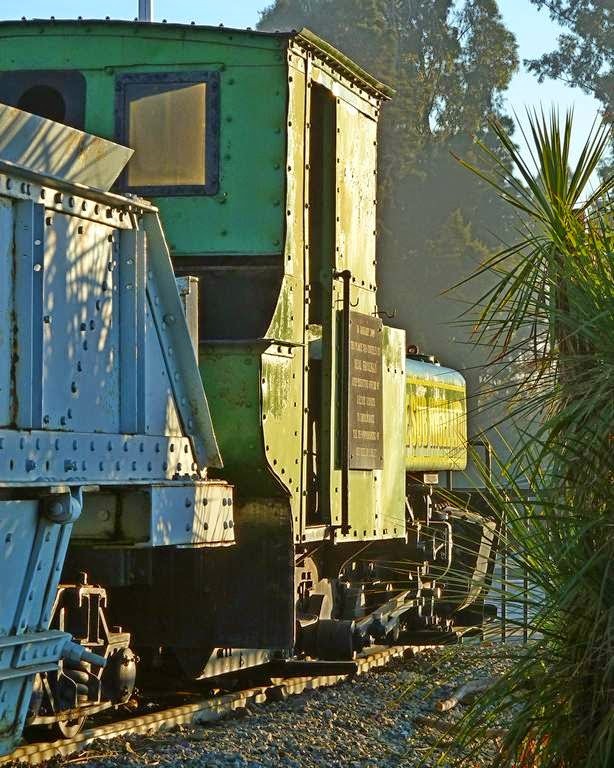 It was enough to see a narrow gauge locomotive – gleaming in the bright sun, with light brown livery almost spotless. r and its two roads were of 2ft 6in gauge. Simmering outside stood an Orenstein & Koppel and a "Hudson" six coupled tank. Inside, another "Hudson" (actually built by Hudswell Clarke for Robert Hudson Ltd.) was receiving a fresh coat of paint, and a Drewry diesel stood dormant. 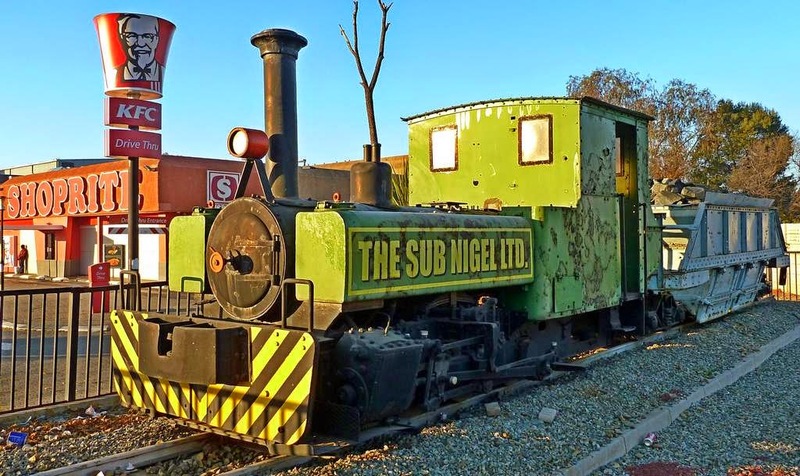 The Sub Nigel mine still operates three shaft's giving access to the gold-bearing "reef", and the narrow gauge system links all of them to the central reduction plant where the ore is crushed and the gold extracted. 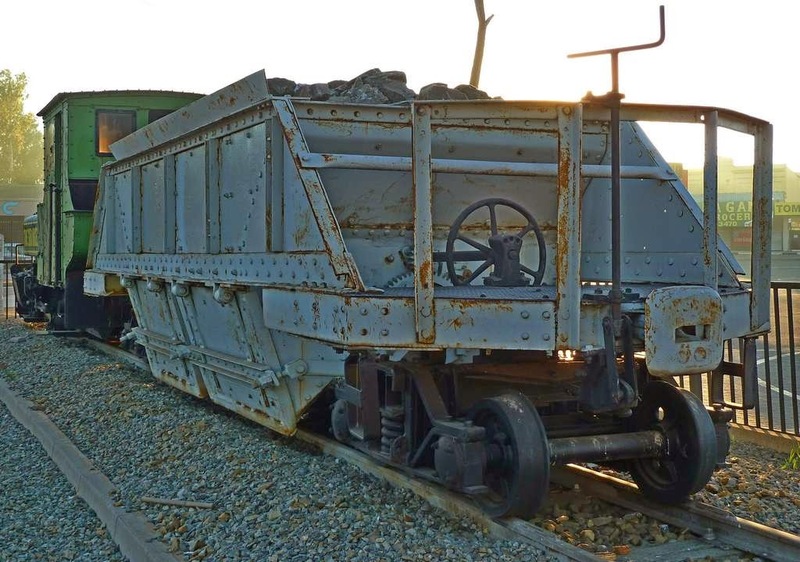 In operation for forty years, the mine has been one of the richest in South Africa, but it is now nearing the end of its life. Rather surprisingly the Drewry diesel is kept as a spare, being deemed unsuitable, and the Orenstein and Hudsons are left to puff their way across the embankment to the south shaft, or under the road to the northern section. But while they triumph today their days are numbered, and it is doubtful indeed whether they will survive the mine. 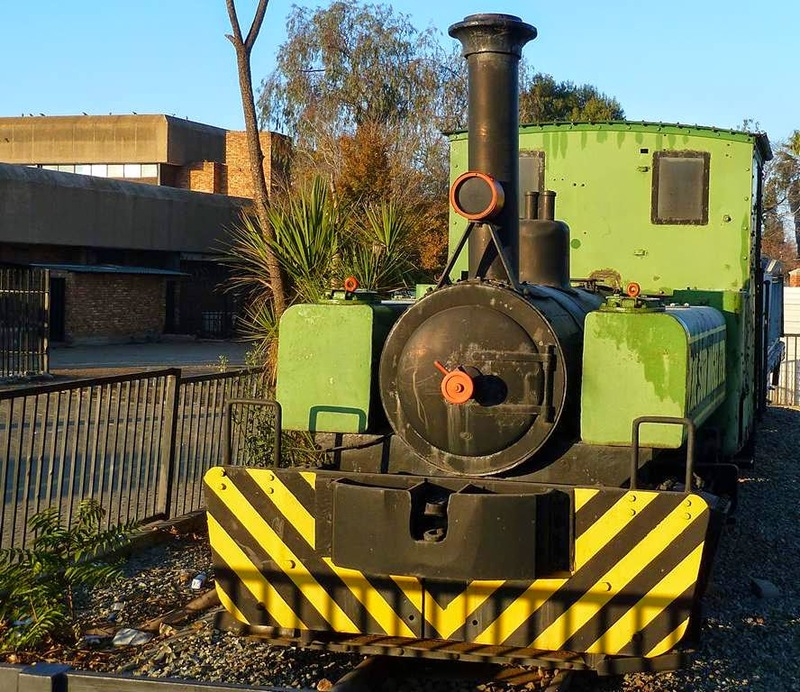 Industrial Locomotives of South Africa 1991 - John Middleton & Huw Williams. wonderful post and hoping to post more of this!